Flat catalog envelopes are great for mailing multiple forms and other multi-page correspondence. But switching to smaller business envelopes saves you money at the Post Office. That’s because the USPS factors in shape as well as weight in calculating shipping costs. 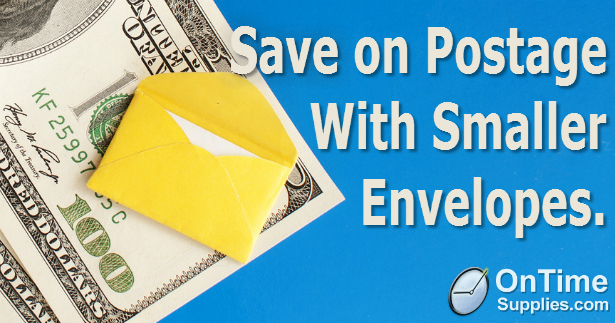 Standard business envelopes are small enough for the USPS 85¢ letter rate. The large catalog envelope typically used for bulky documents does not. That costs $1.35. If you fold your multi-page corrospondence and mail it in a standard #10 business envelope, you’ll cut your postage costs by 37%. If you’re folding a huge ten-page document, your standard #10 envelope is just not going to cut it. You’ll need to go with one that expands to accommodate larger folded sets, such at Quality Park Postage Saving Envelopes. These envelopes are specifically designed for mailing large documents at the USPS letter rate. Of course, not all documents can be folded, so don’t go tossing all your catalog envelopes just yet. Still, mailing documents in the smallest envelope possible is an easy way to get the USPS letter rate on larger mailings.